100 Million Users Affected by Quora Hack – Learn How to Stay Safe! The popular question and answer forum, “Quora” proves to be a great resource for gaining knowledge. From experts/professionals in a myriad of fields to the average Joe, you have hundreds to help you out with various problems. This makes it a great success of the internet, boasting one of biggest sources of information (second to Wikipedia). Sadly, the service is making headlines, following a massive data breach. Approximately 100 million users’ information is now in the hands of an unauthorized third party service! The hack and its impending results were discovered on Friday, November 30th. Quora stated that they realized an unrecognized party was accessing user data. Following the discovery, they immediately contacted law enforcement agencies, while bringing in the expertise of a professional digital forensics and security consulting company. The purpose of this was to find out how the breach occurred and who may be responsible for the attack. While there is no news yet on the specifics, Quora did release a security update. 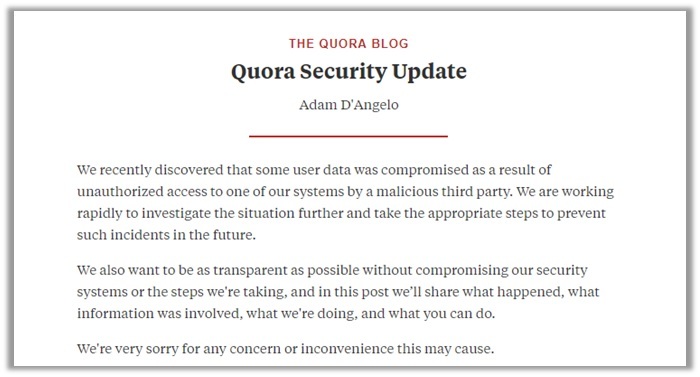 Quora has no idea about how the breach occurred, but the data pilfered is reason enough to worry. The harvesting of names, email addresses, and data from linked networks particularly pose great risk. Some users may have to deal with unrecognized actions on their accounts, which could be quite embarrassing. Luckily, there is no risk of identity theft. Notifying the compromised users by email regarding the occurrence of the hack. Logging out all Quora users who may have been affected during the breach. Invalidating the passwords of Quora accounts affected by the hack. As the 95th largest site of the world, this recent cyber-attack on Quora is highly embarrassing. The website receives more than 700 million visits per month. Users will now face trouble trusting the service with their private information and public answers. Luckily, Quora does not demand financial information on the platform. Otherwise, things would have really got messed up. Use a VPN to protect your identity and trick hackers! Quora is just ONE high-profile hacking case that has made it to the news. A Symantec report revealed that from 2014 to 2015, there was a massive 125% increase in zero-day vulnerabilities and hacks. Another indicated that 43% of cyberattacks are aimed at small businesses. This makes it imperative now more than ever to be extremely proactive about your online identity!